According to the official website, No More Sitting Pretty, Kitty, Sponge Bob was put down Friday night. According to the post, the trouble started approximately two weeks ago, when Sponge Bob developed coughing fits. After some tests, it was determined that the cat had asthma, and he seemed to take to the prescribed medication. Things took a turn for the worse last Wednesday, however, as Sponge Bob started breathing fast and heavy. He was taken to the veterinarian, placed into an oxygenated crate, and kept overnight for observation. The doctors also took x-rays. The x-rays revealed a large mass in the cat’s chest that put pressure on his lungs and pushed his heart out of place. Prior x-rays didn’t detect the mass, but since the last one, it grew very rapidly. Faced with putting the cat through a surgical procedure that he may not have survived, not to mention a questionable quality of life he would have if he made it through the operation, Sponge Bob’s owners decided to let him go. They were with him when he passed. For the uninitiated, Sponge Bob was left at a New York shelter in early June. He weighed 33 pounds. He was adopted by the Farrells a few weeks later and placed on a diet and regular exercise routine. As of July 5th, the cat shed four pounds and was on his way to lose more. 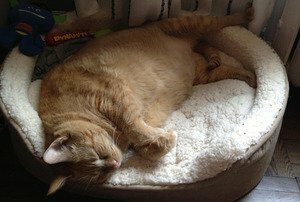 Sponge Bob gained national attention and brought pet obesity to the forefront as a serious problem that is on the rise in dogs and cats. In many ways, Sponge Bob became the successor to Meow, another overweight feline. Meow was left at a New Mexico shelter weighing 39 pounds. After a whirlwind media tour, where he appeared on Today and other New York news programs, he died of pulmonary failure. CatTime salutes Courtney and Matthew Farrell for taking Sponge Bob in and trying to get him into shape. From the NMSPK site postings, Sponge Bob loved his new home and his owners, who loved him just as much. Farewell, Sponge Bob. Rest in peace.